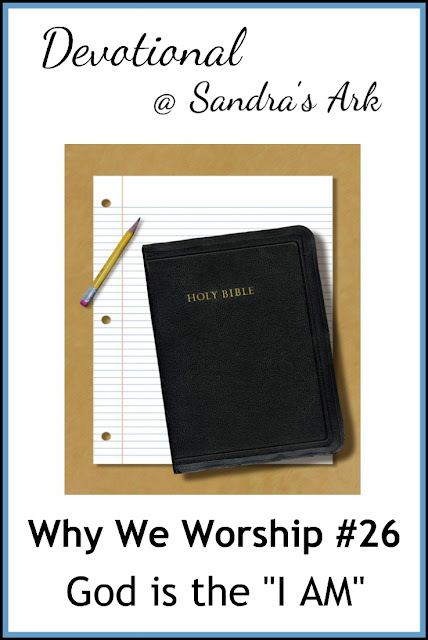 If you have been visiting with me for "Why We Worship" each week I would like to thank you for your company and your comments. I have been writing this for 6 months and today we come to the final post in the series. I think this is the only thing that I could have chosen for our final one. This is the holiest name for God in the Old Testament. There is no-one else who can make such a statement. 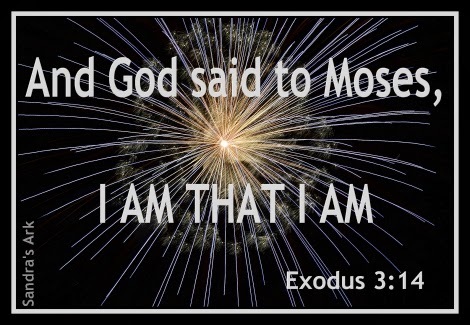 We serve a God who is the only "I AM"
He is the God of NOW! Not a god of the past. He is the God who is ALIVE with us! Not an idol made of bronze or stone. He is the God who is PERSONAL! Not something that doesn't relate to us. "What does it mean I Am? He is what?" some might scoff. He is unfathomable to us. Who could ever think of worshipping anyone else. I like this, but do you mean to say that no one else can say that phrase? (I'm tired and might be missing something) Good way to end a good series it seems! Yes, I do mean that no-one else can make that statement in the context that God has made it. No-one can be what God is. Hi Amy, thanks for dropping in and I'm glad you feel this way. Even though I don't exactly follow everything in the bible. I do believe in God and the power he has. I couldn't imagine believing in anything else. I've thought about it but it seems weird for me. Hi Jazmine, I'm glad you believe in God and His Power. Going on from that I would urge you to believe in the full truth of His Word in the Bible and ask Him to make it real to you. God Bless. He is the Only I Am! 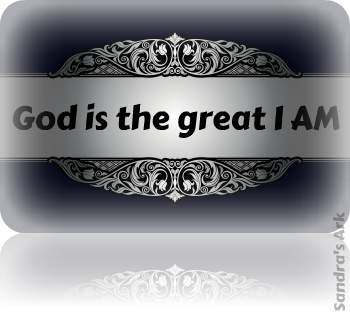 Every Name given to God in the Bible points back to I Am that I Am. Before time began, I Am. Always been, always will be, the Beginning, the Ending, the First and the Last. And He is the only One that can make the claim of I Am. Wonderful!! Thank you for this good devotion this morning. He is the reason I worship! You are exactly right. The very reason. The sorrow for me is knowing that many people in our nation, our towns, our families are serving and worshiping other gods. They often don't THINK of it being a god issue, but to see how their lives change in terms of sinfulness and laughing and rejoicing for the wrong things, the wrong people. It IS a heart-breaker for me. Glad your dealing with it, sharing it. Thank you. So true Caryjo, their eyes are blinded. Prayer needed. Blessed be His Name! Although we know others do choose to worship other gods but He alone is most worthy of worship. How I love this! Worship is one of my favorite topics to write and speak on. I love the way you that you said, "and He is even more besides." Worship always reminds me how limited my vision and thoughts are. Have you seen this short video? Bet you will like it. I am linking through 3 Word Wed. today. So nice to visit your blog again! Limited vision and thoughts is so spot on thank you Ginger. 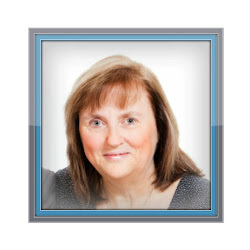 Thank you for the link Ginger, I really should start to look at You Tube more - my husband keeps saying so too. You said it, Sandra. He is the I Am... which make my heart sing with joy and experience incredible peace. AMEN!